NOTE: Deadline to apply is tomorrow (Monday, 10 January 2011)!!! The producers of Norway's version of "Dancing With The Stars" and "American Idol" are coming back to the U.S. to find fun, outgoing Americans with Norwegian ancestry to participate in Season Two of their exciting and enormously successful reality television series "The Great Norway Adventure," according to a press release sent to the Norsk Museum in Norway, Ill.
O'Connor Casting Company is conducting a nationwide search for adventurous Americans with Norwegian ancestry (even a little bit counts) who are interested in auditioning. 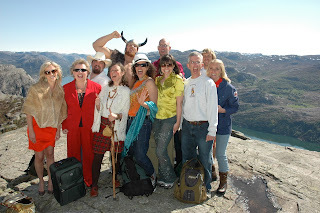 The series follows 12 Norwegian-Americans who are whisked off to Norway to compete in a series of extreme cultural challenges that test their skills, courage and determination. The winner receives a prize worth $50,000 and the opportunity to meet Norwegian relatives they don't even know exist. "We're looking for outgoing people who are truly curious about their Norwegian heritage and want to have an adventure of a lifetime," said David O'Connor, director of casting, O'Connor Casting Company. He adds, "Although season one features exciting and intense challenges like crossing the frozen tundra and eating a sheep's head, the most amazing part of the show is watching each cast member's life changing journey as they discover their ancestry." Season One winner, Doug Miner, from Seattle, said, "This was by far the coolest experience ever. Even though the money was a great incentive, we were all really competing to stay in the game another week because the challenges would take us to awesome new places where we'd meet really interesting people." Miner, who quit his job to participate after his boss, at the last minute, decided not to let him take time off, won $50,000. Miner adds, "The bigger prize was getting to meet my long lost relatives. It was so amazing that I'm taking my mom, dad and family members to meet them in Norway next year." There are more than 4.5 million Norwegian-Americans living in the United States and any of them can apply. Season two will feature new challenges. "The Great Norway Adventure 2," will air in Norway under the title "Alt for Norge" and potentially other countries as well. This series is produced by Monster Entertainment and was rated Norway's No. 1 reality TV show in 2010. To view clips of season one, do an Internet search for "Alt For Norge." To apply, e-mail [email protected] or go to www.oconnorcasting.tv/castingboard to download the application and submission information. Deadline for applying is Monday, Jan. 10. Checkout these clips from season one (via the casting company web site).